This entry was posted on April 3, 2013 by Dan H..
Students experience an average summer learning loss of two to three months of academic material each summer. Additionally, many low-income students have more significant summer learning loss than that of their higher income peers. Out of school time that does not include a structured meal schedule with regular opportunities for learning can be detrimental to all students. 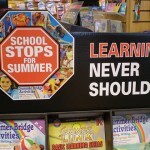 As a parent, teacher, or daycare provider, what can you do to combat this summer learning loss? The good news is that there are a number of inexpensive strategies that are easy to implement for virtually every child. Academic enrichment. Whether a child needs work in a particular academic area, is looking for a new challenge, or could simply benefit from regular academic activities, academic enrichment is a great option for preventing summer learning loss for every child. Before the school year ends, a parent can check with a child's teacher to get recommendations for reading lists, workbooks, outdoor academic activities, and much more. A teacher can also provide specific suggestions that would be beneficial for the coming school year. Some parents seek tutoring directly from teachers as well as outside tutors and supplemental learning centers in order to provide academic enrichment. At DK Classroom Outlet, we carry a large variety of Summer Bridge and Summer Learning books to help children bridge the gap. Local library. Make visits to the local library a regular part of your summer routine. Give children the freedom to select at least a portion of their reading materials. Librarians may have additional suggestions for appropriate grade or age level material. Many libraries offer summer reading programs, which can be a great means for motivating kids to read. Check with your local library for additional opportunities as well, such as story hours and classes. Local field trips. Children get a tremendous amount of education through traveling. However, it is important not to discount local excursions as well. What opportunities are there for learning in your neighborhood? For example, consider a visit to the fire house or the police station or even something as simple as a walk through a park that you've never visited before. Kid friendly websites. Many children enjoy surfing the Internet and will not even think about the fact that they're learning when they're enjoying their time online. There are numerous websites out there for virtually every academic subject. As a parent or teacher, it is important to peruse websites ahead of time before letting kids explore on their own so that kids are not viewing inappropriate content. Local summer camps and classes. Check with local schools and community centers for summer class and camp listings. Many schools open their summer classes and camps up to all children, regardless of the schools that they attend. For example, you may be able to find a great class for your child at a local public school even if he attends a private school. Make sure to explore art and music offerings. Not only do these classes include many opportunities for academic learning but they often keep kids who may not shine in academic areas motivated and engaged with the learning process. Sleep away camps. Not all children are ready for sleep away camps, but they can be a wonderful opportunity for many children. There are a number of camps that are specialized for academic learning, particularly in niche fields including math, science, and technology. Most camps feature a mix of academic classes and recreational activities to keep kids active, engaged, and motivated. Consider the options available through the New York Film Academy, Circus Smirkus in Vermont, and the Omega Institute's holistic learning camps.